Originally built in the spring of 1939, Jennette’s Pier became the first fishing pier on the Outer Banks. It was built at Whalebone Junction on the site that had been a sort of transient camp for workers hired by the US Civil Works Administration to help construct the sand dunes from Corolla to Okracoke. When the pier was constructed, the workers’ cabins were renovated to provide Outer Banks lodging to the men who traveled to the Outer Banks to fish. Once it was completed the, Jennette’s Pier was over 750 feet long and hosted fishermen for more than 60 years. The new and improved Jennette’s Pier offers something for everyone. The $25 million price tag on the reconstruction brings so much more than fishing (albeit the pier is a great place to fish) and hanging out on the pier to possibly catch a glimpse at a whale or other big fish. It is important to note that there are fees for passesassociated with fishing off Jennette’s Pier but even the $2 donation to walk down the pier is worth every penny. When it comes to fun in the sun on Outer Banks vacations, outdoor recreation brings some of the most fun you will ever have. Whether you like to simply spend a week or two lounging by a pool or stepping outside your comfort zone and doing something exhilarating, there are so many endeavors that keep you outside and active. While the OBX offers so many outdoor fun activities, as locals, here are a handful of the things we love to do. Yes, you can ride bikes most anywhere you live but there is something different about riding bikes on the Outer Banks. Whether you want to hop on a beach cruiser to casually ride along the bike paths or along the surf, or you are a serious cyclist who intends to head out every morning for a three-hour ride, the OBX is a great place to spend time exploring the barrier islands as it is mostly flat with a few bridges. A couple of suggestions for casual and family bike rides are to stick to the paths that traverse through the different areas of the OBX. Some go from town to town making it a great mode of transportation for heading out to eat. Also, be aware of those on foot and extend them some courtesies. For intense cyclists, stay off the bike/foot paths as there are wide shoulders along the roads on the OBX – just make sure to ride with traffic as you are treated as a moving vehicle and must abide by the same rules of the road as motor vehicles. Of course, we have to mention this age old activity (and sport) for OBX vacations. There are so many places to fish and so many ways to do it. From simply taking a rod and some bait out to the end of one of the piers to spending the day out in the waters deep sea fishing, this is always a favorite activity for locals and visitors. From several of our vacation rentals Nags Head Pier is a short walk and a great place to take the kids. A more recent way to fish is to go out into one of the sounds on a SUP board and fish off of it. When out on a SUP board, it is absolutely amazing what you see so why not take advantage of it, stand up in calm waters and catch dinner – all while getting a great core work out! For anyone planning a last minute week at the beach, the last week of July is a great week to spend on the Outer Banks. 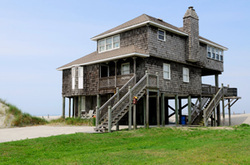 If the pick is a Nags Head vacation rental or one in any of the other towns, we can help with the plans. Explore the Shore Guest Program for Outer Banks Renters Atlantic Realty is excited to introduce a new program for their Outer Banks Renters, the Explore the Shore Guest Program. Atlantic Realty Introduces New Homes for 2014 Atlantic Realty’s rental program is introducing new Outer Banks vacation rentals in 2014. Atlantic Realty is proud to provide you with a relaxing stay on the Outer Banks in one of our Outer Banks vacation rentals. 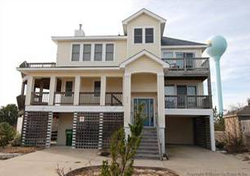 Contact Atlantic Realty to discuss dates and prices for pre-reservation of these beautiful Outer Banks vacation rentals. 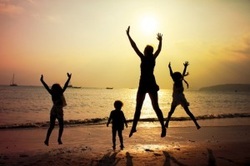 Fun ‘N Sun Program Spring is in full bloom and summer is right around the corner. Fortunately for our guests, this means super-fun, warm weather activities! Here at Atlantic Realty, we have an awesome program called Fun ‘N Sun that entitles our guests to a variety of fun activities for free! We have added a lot of fantastic items for 2013 and we hope that our guests this year will enjoy the new activities. If you’re busy planning an OBX vacation in the future, read on to find out more about our exclusive Fun ‘N Sun program. Come and celebrate Valentines Day on the Outer Banks! Atlantic Realty has a new offer for its guests – the Valentine Vacation package. There is no better way to celebrate this romantic holiday than with an Outer Banks vacation! Whether for a weekend or an entire week, Atlantic Realty has a special offer to make this extraordinary holiday more memorable. Simply book three nights and get a fourth night free or get 15 percent off a full week’s rate in one of the participating Outer Banks vacation rentals in Nags Head or any other OBX community. Take advantage of the Valentine package for celebrating such important events. From an engagement to a wedding to a honeymoon, there is no better destination than on the Outer Banks. Atlantic Realty’s Valentine Vacation package is valid on select properties booked between January 11 and February 11, 2013 for stays between February 9 and February 23, 2013. Guests also receive a complimentary bottle of champagne, heart shaped chocolates and a red rose. Other extras include free early check in and late checkout as well as allowing pets to stay free in participating pet-friendly rentals. There is no better way to celebrate Valentine’s Day than with a romantic trip to one of the dreamiest destinations on the East coast. Let Atlantic Realty help make it a trip to remember. For more information, please go to their website or call them at (877) 858-4795 to reserve your Valentine Vacation Package today.